The properties of ultra-thin layers of large organic molecules like porphyrins, phthalocyanines, and other tetrapyrroles on oxide and dielectric substrates offer potential applications in the fields of molecular electronics, solar energy conversion, catalysis, sensor development, and biointerfacial engineering. There is one common feature to all application-related research in these areas: The functional organic units constituting the organic films are synthesized with atomic precision but the oxide bonding sites, the interaction mechanisms, and the structure formation processes on the dielectric substrate remain poorly understood at the microscopic level. Some information on the interaction of functional groups with oxide surfaces is available for small molecules but the transfer to larger systems is entirely unexplored from a surface science perspective. Despite the practical relevance of the emerging field of organic/oxide interfaces, it is apparent that, from a surface science point of view, the research area is in its very infancy. The reason for this lack of understanding is the fact that a surface science approach to organic/oxide interfaces is outstandingly challenging, both for experiment and theory. Systematic investigations of the underlying physical and chemical interaction mechanisms require a broad spectrum of complementary expertise. Hence, funCOS developed a systematic strategy addressing the fundamental understanding of functional organic/oxide interfaces. We chose prototype oxide surfaces as substrates that can be characterized at the atomic level. A broad spectrum of state-of-the-art experimental and theoretical surface science techniques is employed to unravel the interactions and growth mechanism of test molecules of reduced complexity with ideal oxide surfaces and defects. This atomic-level perspective allows us to build complex systems in a controlled fashion. Such systems include nanostructured multicomponent films on nanostructured oxide surfaces, supported nanoparticles, and oxide nanomaterials. An in-depth understanding of organic-oxide interfaces could be obtained from a surface science approach which is outstandingly challenging, however, both for experiment and theory. The DFG Research Unit funCOS aims to create the knowledge on the underlying physical and chemical interaction mechanisms at the microscopic and the molecular level. 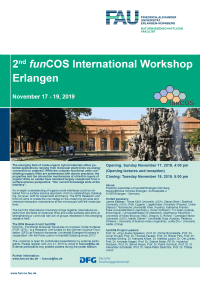 The funCOS International Workshop brings together international experts from the fields of molecular films and oxide surfaces and aims at strengthening a worldwide network of groups interested in this emerging research field. The workshop is open for contributed presentations by external participants. Please register until July 31, 2019 by email to funcos@fau.de. External participants may present posters during the poster session. funCOS supports the HZB Photon School 2019. The HZB Photon School aims at master's students and early stage researchers in physics, chemistry, materials science, engineering, life or environmental sciences. Students will be introduced to synchrotron and laboratory-based methods that probe the molecular structure, function and dynamics of complex material systems.